Literary Arts does such a nice job. I used to go every year, but I sort of was done. Monday night, I got to experience once again a literary event in a sold out house, and it was fabulous. Everyone loves a good story, and 2700-ish Portlanders got to hear 5 plus great stories on Monday night, December 15th at the Schnitz. The storytellers from near and far were each amazing – practiced, smooth, intense, and riveting. The stories themselves were both hilarious and sad. Really, each story was essentially a literary short story in the level of detail, use of literary devices, and development of the plot. 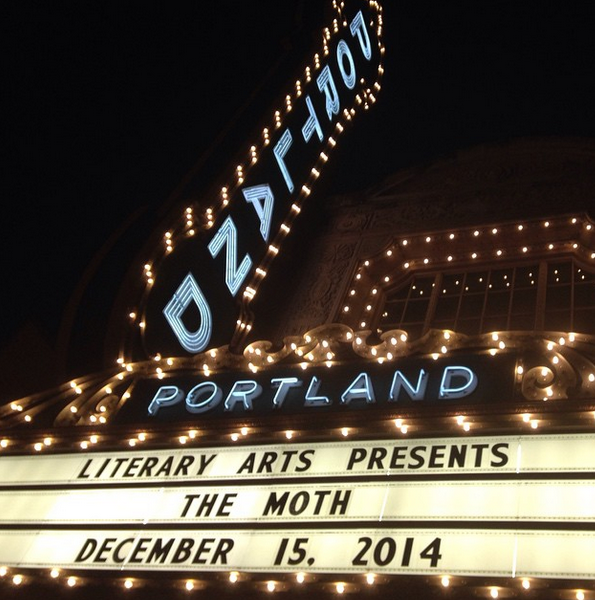 It makes sense why The Moth would be a Literary Arts thang. Adam Gopnik from The New Yorker served as host, and his appreciation for all things PDX shone through every time he spoke. There was much laughter from the audience when Mr. Gopnik mispronounced Oregon. He was especially delighted to announce that Monday night’s Moth was their largest audience ever. Go Portland! The two saxophone players from the Blue Cranes provided interesting and melancholy musical interludes, helping to set the stage for the stories. Check them out on February 21st, their next PDX show. The highlight for this writer was Mr. Vin Shambry’s 10 minute story. He told an emotional and amazing story about his 6th grade year of being homeless and getting to attend Multnomah County’s famous and popular Outdoor School. I knew it was a hometown crowd when it was clear that the audience was able to see and feel everything he said about his Outdoor School week. Hearing about those cool high school counselors, the cabins, the campfires and s’mores, the songs, the learning, and the clean sheets and good food made me realize how important Outdoor School is to the young people of PDX. My next-door neighbor was one of those cool counselors last year, and her life was changed thanks to that experience. It sounds like Mr. Shambry had a similar experience. Keep it funded, Multnomah ESD!